The High Court in St Kitts, on Monday morning delivered a ruling on a motion brought by Leon Natta which challenged the constitutionality of the Public Service Act Statutory Rules 36 and 38 which prohibit civil servants from participating in political activity, holding office in a political organisation and contesting a general election. Speaking to Freedom Fm’s News Desk on Monday Mrs Angelina Sookoo Bobb an attorney on the team representing Natta indicated that Mr. Natta, a government employee, was on October 10, 2018 suspended from duty when the Public Service Commission charged that he had been actively involved with a political organisation, having introduced himself to a constituent as a political candidate. Natta moved the court seeking a declaration that Statutory Rules 36 and 38 infringed on his constitutional rights . 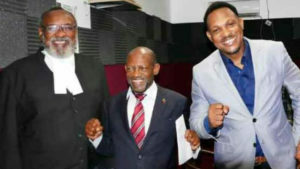 His Honor Justice Eddy Ventose heard oral submissions from Natta’s Attorney Sylvester Anthony and from Douglas Mendes SC, who represented the respondent in the case, the government of St. Kitts and Nevis. Justice Ventose, on Monday ruled that the restrictions imposed by the Public Service Act Statutory Rules 36 and 38 are indeed unconstitutional. Natta-Nelson is believed to be the St. Kitts-Nevis Labour Party candidate to oppose the sitting Parliamentary Representative for St. Christopher 7 (Ottley’s to Harris), Prime Minister Dr. Timothy Harris.